Sci-Fi Spotlight: John Varley’s Gaia Trilogy Is Complete & On Sale in Kindle Format! John Varley’s bestselling, classic Sci Fi Gaia trilogy has finally been published in full in Kindle format, and all three books are currently priced at just $5.99 each! Many readers say this series is a like a Science Fiction Lord of the Rings. 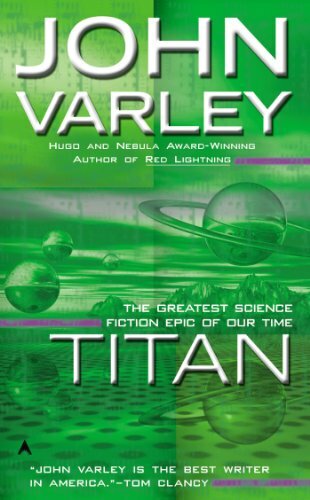 John Varley’s monumental trilogy – Titan, Wizard, and Demon – has achieved cult status, hailed as a modern triumph of the imagination by critics and fans. It begins with humankind’s exploration of a massive satellite orbiting Saturn. It culminates in a shocking discovery: the satellite is a giant alien being. Her name is Gaea. Her awesome interior is mind-boggling – because it is a mind. A mind that calls out to explorers…and transforms all who enter. Cirroco Jones and her crew are sent on a mission to explore the moons of Jupiter, and when they approach the moon Titan, they make an amazing discovery: Titan is not a moon, but what appears to be a gigantic space station in the shape of a wheel. The discovery of what is the actual nature of the wheel is the whole point of the book, and early in the book, the natural defenses of the wheel grab Cirroco’s ship and crew out of space. They essentially get absorbed into the machine, only to be “reborn” on the inside of the machine. Each of the crew goes through a metamorphosis in this re-birth, not all survive, some transformed for the better, some transformed with psychoses or neuroses. And along the way they discover a myriad of fantastical creatures much out of mythology, like a race of centaurs, angels, and more than I can go into much detail about. This book is a prime example of what science fiction used to do: tell a compelling story, keep you guessing at what all the details of the universe are (you’ll have to read Wizard and Demon, the two sequels to find out all the truth about this world the humans call “Titan”) and is well edited, that is, it is not an overblown novel stretched out to some 700 or 800 + pages the way many writers do these days. 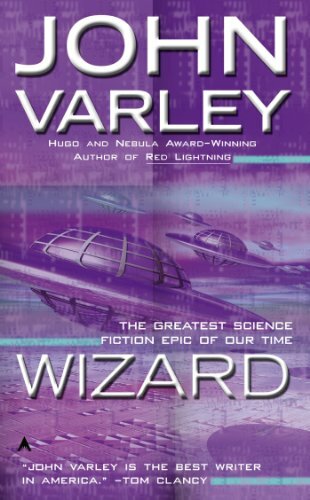 One of the greatest science fiction epics ever written, John Varley’s Titan, Wizard, and Demon comprise a groundbreaking trilogy that will live forever. Human explorers have entered the sprawling mind of Gaea. Now they must fight her will. For she is much too powerful…and definitely insane. We were introduced to the alien Gaea in Titan, when our characters came to investigate. Now we get to explore it in a great-circle journey around the rim, visiting almost every region. John Varley has created an intriguing, unique landscape in this installment of his trilogy. Not only is Gaea a world and a god, but she is also a political being with a sharp eye towards the future. The satellite-sized alien Gaea has gone completely insane. She has transformed her love of old movies into monstrous realities. She is Marilyn Monroe. She is King Kong. And now she must be destroyed. An astonishing climax to a magnificent trilogy.